INDIANAPOLIS – On his darkest, sickest days, when the cure burned like poison through his body, Chuck Pagano kept a sheet of paper taped to the wall beside his hospital bed. The paper had a list of names and numbers that a football man would recognize as the depth chart of the Indianapolis Colts. And as the chemotherapy did its best work in fighting Pagano's leukemia, the depth chart became his constant connection to the life he once had as the Colts' head coach. The one he refused to give up, the one to which he was determined to return. And whenever Colts general manager Ryan Grigson visited with news or updates or stories to tell, Pagano nodded toward the chart on the wall. "Grigs does it look right?" Pagano would ask. "Um no," Grigson replied, scratching out a name and writing a new one. "This guy's on IR." But as the weeks went by and more strange, handwritten names appeared on the paper, it was clear to Grigson that the chart had become something living – an inspiration pushing Pagano toward returning to his players before season's end. And yet how could the coach know, as he lay on the bed, that he was the one inspiring them? There is no better story in the NFL this year because who could have imagined this? How could the Colts, one of the league's most stable franchises for the past 15 years, blow up the structure: dump its face (Peyton Manning) and architect (Bill Polian), fill the locker room with new faces (including rookie quarterback Andrew Luck), lose its new coach to something called acute promyelocytic leukemia and still be 9-4 and on the verge of the playoffs? There is little statistically to say Indianapolis should be doing this. Aside from total offensive yards and passing yards, the Colts are outside the top 10 in most categories, and they have 16 more turnovers than their opponents. The roster is filled with a bunch of unknown players, many of whom are rookies or castoffs or guys no one else discovered. This mixture is more befitting of a team 4-9, not 9-4. "I still don't know who we are really," says longtime Colts quarterback coach Clyde Christensen. "We just do our job for 60 minutes." They say this has everything to do with the man who isn't here. They say Pagano left such an inspirational foundation of unity before he fell ill that they play for the coach who they never see save for home games when he can be spotted in a luxury suite beside Grigson or owner Jim Irsay. They say this has given them a purpose, an adversity through which to fight. Many imply it is the best season of football they have ever had. And so earlier this week, interim coach Bruce Arians leaned against the hallway wall at the Colts headquarters, thought about Pagano and gave a slight smile. "I think as long he overcomes it and gets healthy and goes back to being himself, it has galvanized this football team," Arians said. "In a weird way maybe it has helped this franchise take a bigger step forward." The best story in the NFL is a tale of perseverance and determination; of a team that fights to pull out victories in games even it didn't expect to win. And it began with a ringing telephone. 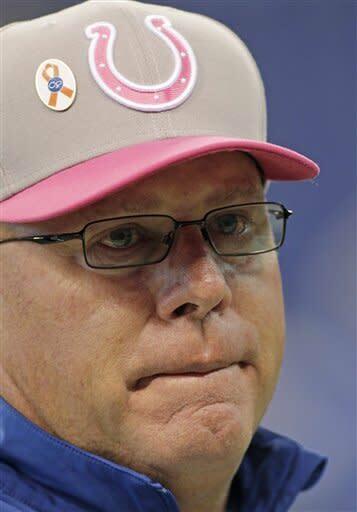 Not long before noon on Sept. 30, the last day of the Colts' bye week, offensive coordinator Arians was preparing to leave his Georgia vacation house and fly back to Indianapolis when Pagano called. This in itself was not unusual; he and Pagano had been friends for years, they talk or text all the time. Arians knew Pagano had not been feeling well and had been to see a doctor a few days before. However, Pagano began the conversation in his usual, confident tone so Arians didn't ask about the coach's health as they chatted for a time about other things. "I have leukemia," he said. Then he added: "Mr. Irsay wants you to coach the team." The next hours were a blur. Arians, who had prostate cancer in 2007 and spent that year's NFL draft wearing a catheter under his clothes, fired off questions about Pagano's treatment. Did he have a plan? When did he start chemotherapy? Once satisfied that Pagano had good care, Arians ended the call and left for the airport. On the flight back to Indianapolis, Arians scoured his iPad, searching for anything he could about Pagano's illness. How serious was it? Treatments? Recovery rates? The last thing he thought about was football. He didn't worry much about the speech he would make the next morning to the team. "I don't plan stuff," he says. "I shoot from the hip"
In deciphering this season, trying to grasp how the Colts could thrive as their inspirational coach has been away, much of the credit goes to Arians, known not as "Coach" but rather "B.A." He brought an easy, calming personality to the team. 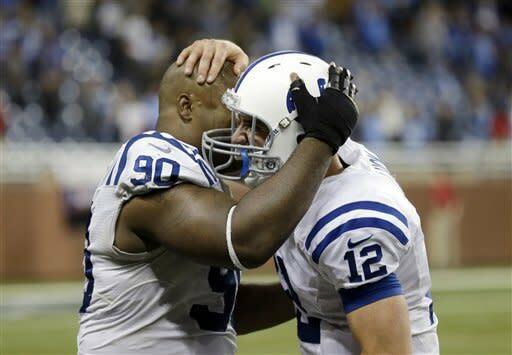 At the time, the Colts were 1-2 and the year could have easily tumbled into turmoil. Instead, Arians spoke quietly, carrying out Pagano's initiatives while at the same time pushing the team to improve. "He's ultra confident in what he does and [the players] are not going to buy in to what they don't believe," says Grigson, who along with Irsay knew immediately he wanted to make Arians the interim coach when Pagano informed them of his illness. "But when the man talks he backs it up, he's got the track record. It's been an extension of Chuck. Then you bring in his offensive expertise. When he coaches, it's a brash strong, in your face style but then it has some light-hearted moments but not enough where he is bringing someone down." The thing that impresses Grigson and others in the organization most is how personal Arians made Pagano's absence, letting the players feel as if their coach was with them, never acting as if he had been made the head coach himself. It is a fine line to walk; commanding the respect of being a head coach while at the same time letting everyone know you are merely a caretaker for someone who will return. Many coaches wouldn't have been able to handle this, given the temptation to create their own legacy. "He never lost sight of the fact his buddy is sick," Grigson says. "When you see him with his actions every day, you know there's never been a time when he hasn't let his team know that his buddy is out sick and fighting for his life. To me that is the human side of this." At the first practice without Pagano, Arians stood before the team. He reminded the players that after every practice or locker room huddle, they always ended with a chant that began "1-2-3" and ended with a keyword or two like "finish" or "work hard." Weren't all those things Chuck?, he asked. They nodded. And so there, on the field, he created a new tradition. Whenever the team gathered and then broke apart they would yell: "1-2-3 Chuck." From there everything seemed easy. Nobody had to force the idea of "team." There was now something different to pursue, something bigger. A name. A face. A missing coach. If there is a most important moment of this Colts season, it might actually have come back in January with a missed field goal in a stadium halfway across the country. Grigson had been on the job for a week when he sat in his office at the Colts headquarters and watched the AFC championship. On his desk sat a list of assistant coaches he still wanted to interview for the open head-coaching job, but couldn't contact yet because their teams were still playing. Pagano, the Baltimore Ravens' defensive coordinator, was at the top of the list. The year before, when Grigson was the Philadelphia Eagles' player personnel director, he tried to help the team hire Pagano as its defensive coordinator. He still keeps the roster for that year's East-West Shrine Game on the back of which he took notes about what other coaches said about Pagano. The coach always struck Grigson as a leader despite being 52, which is old for a first-time head coach. Pagano's résumé read like that of a diligent football lifer, who had been an assistant at 10 places ranging from UNLV to the Oakland Raiders, rather than a promising, young head coach teams typically hire. Yet there was something appealing about him. He had a presence that so many of the great head coaches have. Pagano was still distraught about the Ravens' AFC title game loss when Grigson called the following morning. He wasn't sure he wanted to leave Baltimore after just one season as coordinator. Grigson understood, but also needed a coach. He kept pushing Pagano to come to Indianapolis for an interview. "This is what you have worked your life for," Grigson said. Pagano stalled. He wasn't sure. Maybe the timing was wrong. Finally he said: "My suit is dirty, I don't think I have a suit to wear to an interview"
"Just bring your soul, man!" Grigson said. A few days later, Grigson's heart raced as he interviewed Pagano. The coach was everything he hoped: a strong, enthusiastic presence. At one point Grigson showed his yellow legal pad to the teams' longtime COO Pete Ward. On it he wrote: "Players will run through walls for this guy." During a break in the interview he turned to Pagano and said: "How pumped up are you?" Pagano looked taken aback. But Grigson was sure he had already found his head coach. And there Pagano was, three days after the Patriots loss, telling Grigson he was taking the job for which he wasn't sure he wanted to interview. "Let's hunt," Pagano said before hanging up. This became a phrase Pagano used constantly around the team, one of many he used to bring together a disparate roster of unknowns that Grigson kept finding. Signs appeared around the locker room reading "Team Team Team." He talked constantly of playing for each other and not for themselves. Such phrases are common around football teams, all of whom put up signs with slogans that are designed to inspire and create unity, but there was something different about the way Pagano delivered his words. "It's just his charisma," says Colts defensive end Cory Redding, who had played for Pagano in Baltimore. "He has an ability to bring people together. He will make the smallest person in the building feel like the most important person in the building. If that guy is a janitor, he will make that janitor feel like he's very important." "I don't think he's had a bad day in his life," backup quarterback Drew Stanton says. They knew something was wrong when they gathered in the auditorium for their regular Monday 8:30 a.m. meeting and every team employee was in the room. When 8:30 came and went and the always punctual Pagano didn't appear they looked around nervously. Then Irsay stepped to the podium and delivered the news that their coach was sick. 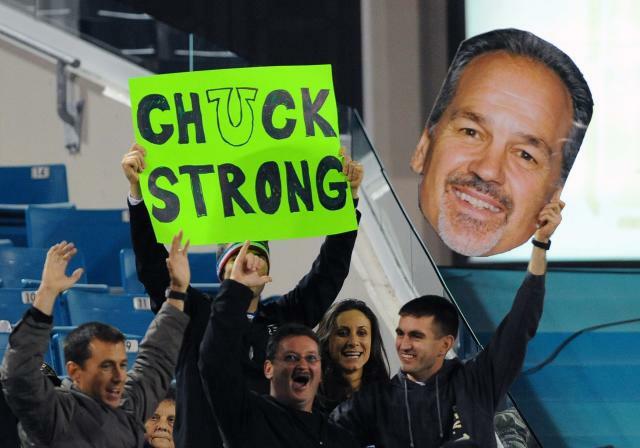 It's hard to say how much Pagano's leukemia has inspired them to win eight of 10 games in his absence. "To every guy it's different in this locker room," Luck says. "I do think it's something that has brought us together." If nothing else, it gave them something in common, an emotional link around which to build. Then came the first game, at home against the Green Bay Packers, when the Colts fell down 21-3 in the first half and Arians would later say he was afraid they would lose 50-3. "Our coach was in the hospital fighting cancer. We could have laid down and nobody would have said anything," Grigson says. Instead, cornerback Jerraud Powers intercepted an Aaron Rodgers pass in the third quarter to set up a touchdown and Luck completed pass after pass, many to receiver Reggie Wayne and they had an unimaginable 30-27 win that seemed to ignite something in the team. Soon there came the texts, dozens of them from Pagano, who was still lying in the hospital, trying desperately to keep up with practice films sent daily to his iPad. Week after week, as the team won, players' phones buzzed. Running back Vick Ballard got several "congratulations" after big runs. Other players got quick coaching suggestions that Pagano picked up on the practice films. Even the phone of Chandler Harnish, a practice squad quarterback from Northern Illinois, beeped one night when his school was playing on television. "I'm watching your boys tonight," Pagano wrote. Harnish laughs as he recalls this. "We don't want to disappoint him," he said. And yet where would they be without Luck? Perhaps out of duty Grigson went through the process of evaluating both Luck and Robert Griffin III when choosing the successor to Manning. He was intrigued by the great mix of speed and arm strength that RG3 possesses, but there never was much doubt about who he would choose with the No. 1 pick. "You know what it really was?" Grigson asks. "There was no gray area with Andrew. I needed a guy who we could plug in and play." Still, there is a difference between inserting a rookie quarterback into the lineup and expecting him to lead a team to the playoffs. Those around the Colts say Luck has a remarkable ability to absorb a lot of information and decipher it quickly. The quarterback himself jokes that Arians "threw the whole kitchen sink at me." But he also believes that the pressure to learn made him better. Arians has always believed in giving his quarterbacks great leeway in running a team. When things break down, the quarterback has to be able to improvise. And so many times this year, as the Colts trailed in a game and needed something big to happen in the fourth quarter, it has been Luck who has delivered the necessary plays. "He's got a will to win," Arians says. "All the great ones have that. But you can't measure it. Coaches will tell you that [when scouting him] but there's no test for it. You can see how high they jump or how fast they go but there is no test for the heart muscle." The irony is that even though Luck has led Indianapolis on late drives in six of the Colts' nine victories, his statistics say this should be a disaster. He has 18 interceptions, far more than Griffin or Seattle's Russell Wilson. His passer rating is a meager 74.5. There have been many mistakes. Arians shrugs. Sometimes interceptions happen. The two he had in Sunday's 27-23 win over Tennessee, one the interim coach blamed on the receiver and the other came when Luck was scrambling, trying to avoid a sack and was hit in the leg. Since Arians wants Luck to make big plays when things are falling apart, he was hardly going to criticize the second interception. "Andrew is a great forgetter," Christensen says. Instead Luck is unburdened by his failures, which the coaches are convinced, allows him to attack at the moment they need him most. "He's got that God-given ability," Arians says. "Go play ball. Don't worry about it." Then came Nov. 4 and another of these crazy, late-game victories, when Pagano – ecstatic over the win – stood up in the luxury box, turned to Grigson and said he wanted to talk to the team. This was not a simple task because Grigson had made himself what he likes to call "The Steward of Chuck's Health." There were medical concerns with taking a patient undergoing chemotherapy into a locker room. By nature, such places are festering with germs. Grigson had to call Pagano's doctor to get permission. When it was finally granted and Grigson and Pagano walked through the door, the players, gathered in a circle, turned and stared at the gray, weakened man who had been their coach. Then slowly they moved back. "Like the parting of the Red Sea," Grigson says. When Pagano spoke of living to hoist a Super Bowl trophy with the Colts and dance at his two daughters' wedding – a clip played repeatedly for several days – everyone could see what the players had felt all those weeks before he got sick. "It's amazing how in your weakest state you're your strongest," Grigson says. "Because as weak as he was, what he said touched the entire world." A few days ago the Colts announced that Pagano is expected to return for the regular-season finale. How fitting it will be if the players and team employees file into the auditorium that Monday beforehand and right at 8:30 a.m., the door opens and Chuck Pagano steps back onto the stage? Only then will the best story in the NFL seem complete.